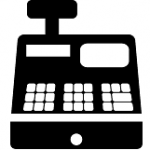 The Retail Cashier Resume Template provides a valuable advantage to job seekers engaged in a difficult search for sought after positions. 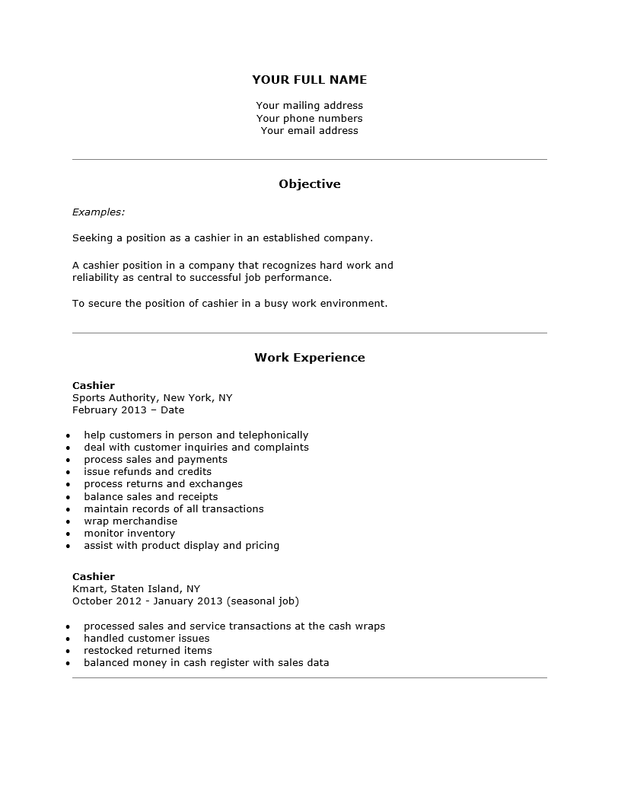 The primary function of the Retail Cashier Resume Template is providing users several predetermined sections which contain information recruiters expect to see when reviewing an inquiry. Job seekers who take advantage of the template should be prepared with their job history, a reasonable amount of free time, and a general knowledge of how to phrase statements in a professional manner. 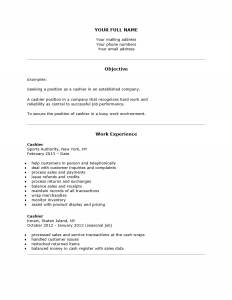 Once a Retail Cashier Resume Template has been filled out it may be used repeatedly as is or customized for a specific employer’s requirements. It is generally understood that a quick response with an above average resume will often result in an in-person interview. Step 1. On the top of the page, on the first line, enter your full name. Then on the following lines your street address, phone number, and email address. Step 3. The Work Experience section is strictly to report information regarding your previous employers and duties with them. The first line of an employer entry should contain the name, city and state of the employer you worked for. The following line should contain a date range for when you were employed with that company. If you had a specific job title, you may but this below the date range. The rest of the entry should be a list of your duties or responsibilities. Also if you contributed in some manner of notoriety include this here. Make this a bulleted list. If there are more than one previous employers list them in descending chronological order. Step 4. The Education section is where you will divulge your academic information. This should include the name of the schools you attended, the city and state, the year of graduation and the type of degree you earned. Step 5. The Technical Skills section will be where you enter you’re the computer programs, and or machines you are familiar with. Step 6. The Core Competencies section is where you will enter personal qualities that you possess that may be valuable to an employer. (i.e. punctual). Step 7. If you have references, state they are available in the Reference section. If not, then delete this section.